Human head lice are annoying little monsters. They are small insect parasites that roam about on your hair and scalp, feeding on your blood and laying eggs on your hair shaft. There are a lot of myths about head lice, and there are lots of opinions about what works best to rid yourself of a lice infestation. Many believe that hair dye is a simple solution to a creepy dilemma, but there are no scientific studies that have proven this to be true. What's more, it's far from being the ideal solution. There are two chemicals in hair dye that are believed to be responsible for killing head lice. Hydrogen peroxide and ammonia are both considered highly toxic, both to lice and people. These chemicals may kill lice, but there are some reasons they may not be the perfect choice. Lice lay eggs that are called nits. They have a hard protective shell and are attached to the hair shaft with a glue-like substance. People have different opinions on whether hair dye kills nits. However, it's best to assume that even if the lice are gone after you dye your hair, there still will be nits clinging to your hair shaft that will incubate and hatch in the next week or two - setting you back where you started. Head lice have a 38 to 45 day life cycle. Nits take eight-12 days to develop and hatch. The young lice (nymphs) attach to your scalp until they are old enough to reproduce. The mature lice lay their eggs on your hair shaft, and the cycle will start all over again. 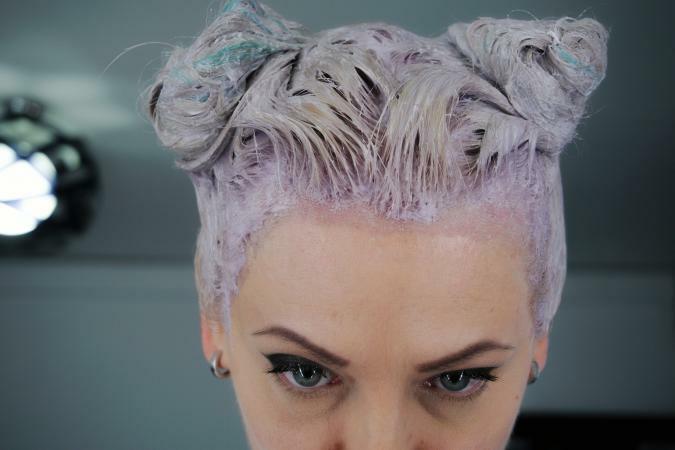 With this in mind, dying your hair is probably just a short-term solution. Should You Use Hair Dye to Kill Lice? Hair dye may work to kill lice in the short term, but that doesn't mean it's the right choice. If you're considering using dye, keep the following in mind as you decide. To ensure all the nits have hatched and that you've ended the cycles, it would be necessary to dye your hair again on the 7th and 14th day after the initial dye job. This might end the cycles, but it would also damage your hair. Children are more prone to get lice than adults. However, hair dye should never be used on a child. In addition to other potential risk factors, a child has immature hair and is much more susceptible to damage from hair dye and bleach. You'll have to do it yourself, and it can take hours and big bucks to fix a bad do-it-yourself hair dye. In many states, it's illegal for a hairstylist to perform any salon services on a patron who has head lice or nits. If you love your hair's natural color and texture, why chance messing it up using a hair dye for a lice infestation? It could take months of hair cutting before the hair color is gone and your hair is back to normal. Although hair dye may work as a short-term solution, there are better options. These include non-toxic shampoos or home remedies that won't damage your hair but will rid you of the pesky parasites. Should you decide to try hair dye, keep a watch on your hair for the following 10 to 15 days to make sure the infestation doesn't begin to reemerge.